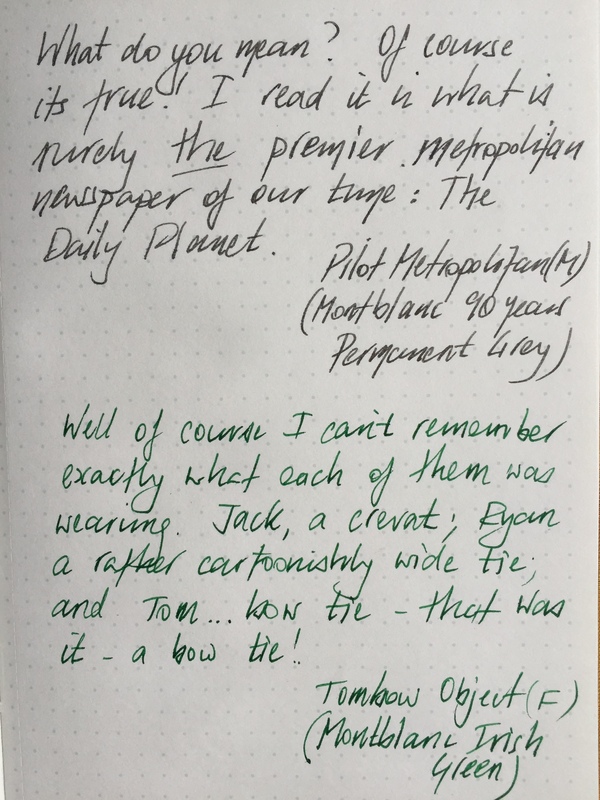 With a Pilot Metropolitan having been in my collection for almost 12 months now, upon recently receiving a Tombow Object, I was struck by how similar these two pens actually are. 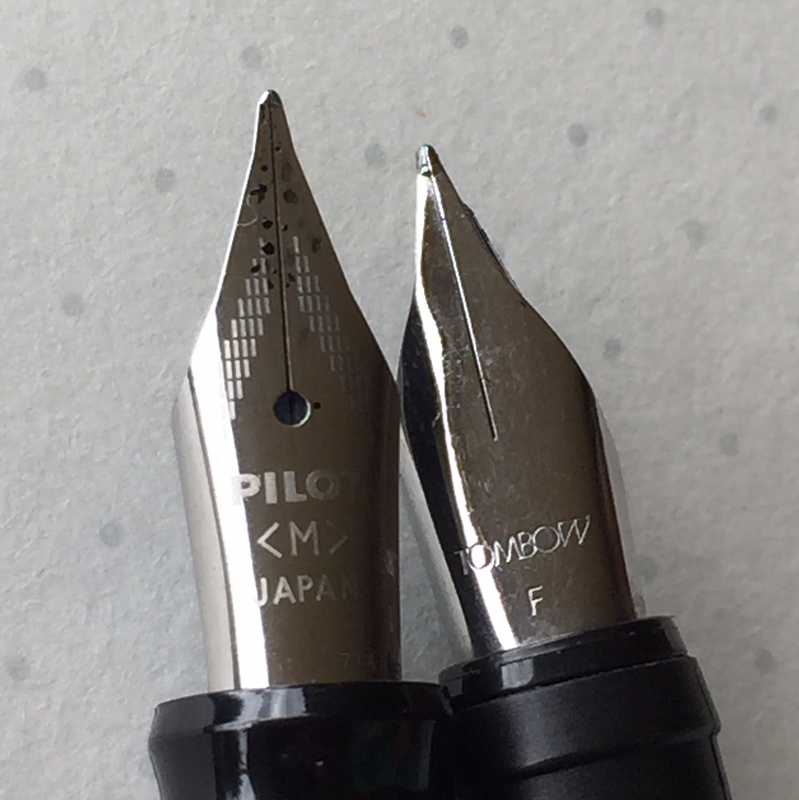 My original Metropolitan had a fine nib, which met its demise after about 11 months of use, when a very small part of the nib tip popped off while writing. Although I then had an instant stub nib, it was a little jagged for writing! The Metropolitan you see here came with a medium nib. Both of these particular pens were received from the very kind gentleman I wrote about in a previous post. The similarities in these pens were immediately apparent in relation to appearance; to some degree the design, and how both felt in the hand while writing — I see am not alone in thinking this. When capped, both are of a very similar length and shape, tapering towards both ends. The Tombow remains a little larger in diameter at the end of the body and cap, whereas the Metropolitan continues to a slightly finer taper. The Metropolitan is noticeably the heavier of the two, however both are quite well-balanced when putting pen to paper. Both have sturdy, well-functioning clips, with the Metropolitan sporting a feature band of decorative patterning around the centre of the barrel. This particular one being the Silver Zigzag model. A nice touch, however probably adds no more aesthetic value to my eye. Both pens have a metallic, brushed aluminium looking finish on the entire exterior (with the exception of the zigzag addition to the Metropolitan) — a type of finish I do like, and particularly suits some of the more colourful options available in the Tombow Object series. Differences can be seen in overall nib length; step at the junction of section and barrel of the Metropolitan; and the Tombow’s matte finish on the section. You could say the similarities end once the snap on/off caps are removed and the grip sections are exposed. The Metropolitan’s shiny gloss plastic (resin?) 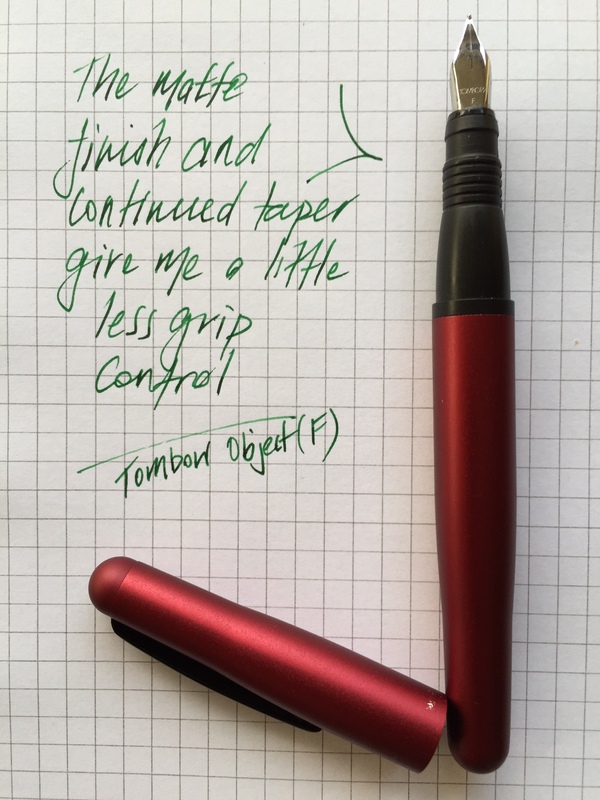 grip section is immediately apparent, whereas the Tombow sports a more subdued matte finish. Both have visible and palpable lines running the length of the grip section from the manufacturing process, and although virtually unnoticeable, are not evident on more expensive pens. Certainly not an issue and I only mention it as I analyse the grip sections a little more closely for comparison. The taper, length and step of the grip section is the biggest difference I find in these pens, and I will elaborate further in Writing Performance below. 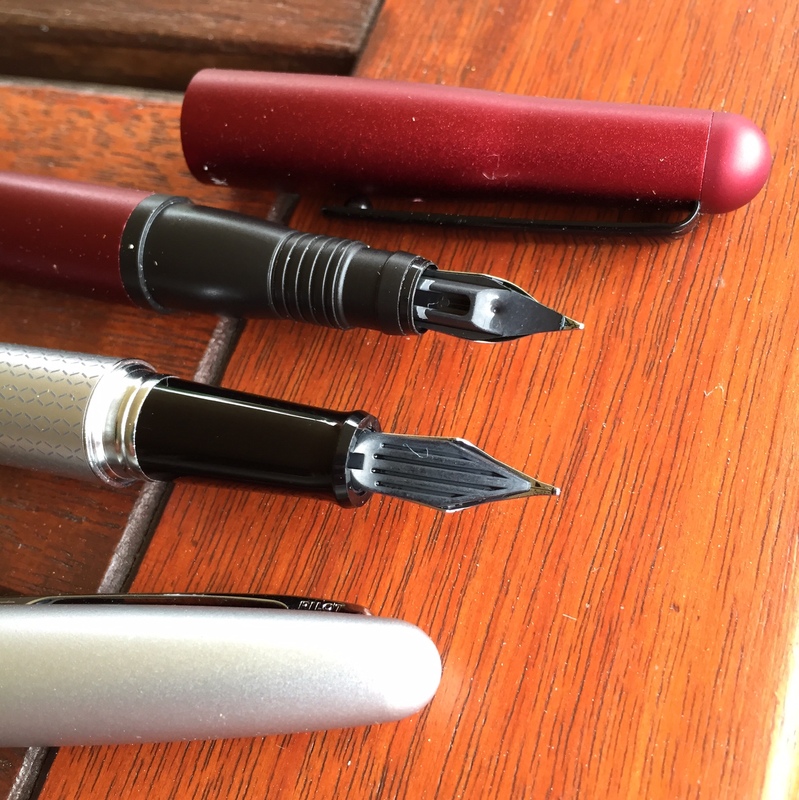 Overall, I like the look of both for sturdy, everyday use pens, and given the similarity, if I like one, it goes without saying I like the other. On appearance alone, I really couldn’t pick a favourite between the two. As you’ll note from the lists above, it is certainly not hard to see why these pens are very, very similar in look and feel — the most obvious difference being of course the weight. For overall balance, I honestly could not pick one over the other despite this obvious difference, however if you were someone who posted their pens — for me at least — this would make things a little top-heavy with the Metropolitan. You’ll also notice both are sold as cartridge/converter fillers. Not being overly adept with the included squeeze mechanism converter included with the Metropolitan, I swapped in the CON-50 converter which I’ve always found easy to use and very reliable. I have only used a standard international cartridge in the Tombow. When putting pen to paper, it is again quite amazing just how similar these pens are, even more so with the medium nib of the Metropolitan and fine of the Tombow. Despite the Metropolitan’s M nib and Tombow’s F – the line characteristics were very similar. From what I recall, this would certainly not have been the case with the fine nib of my previous Metropolitan. At times I found the fine nib a little scratchy on certain paper types, and overall it was probably too fine for my writing style. The medium nib on this model is a far better fit for me. The line widths, nib feel and smoothness are very, very close. Both lay down ink very well, with the only real difference in feel the marginally stiffer nib on the Tombow. Even with slightly more flex to the Metropolitan, both pens showed minimal (and pretty even) line variation with changes in pressure. There is no doubt these are really great nibs — both of them. I keep harping about the similarities in these pens, so we should probably have a look at some of the differences as well. My standard grip as shown with the Metropolitan. That grip section. Here is where the suitability of each pen might vary widely depending upon your particular writing grip and style. I believe I would call mine a fairly standard pen hold, and with that, the Metropolitan suits my hand better than the Tombow. With the Metropolitan, there is a significant step down from the barrel to the section, which in itself may be a problem for some, however suits my grip perfectly. 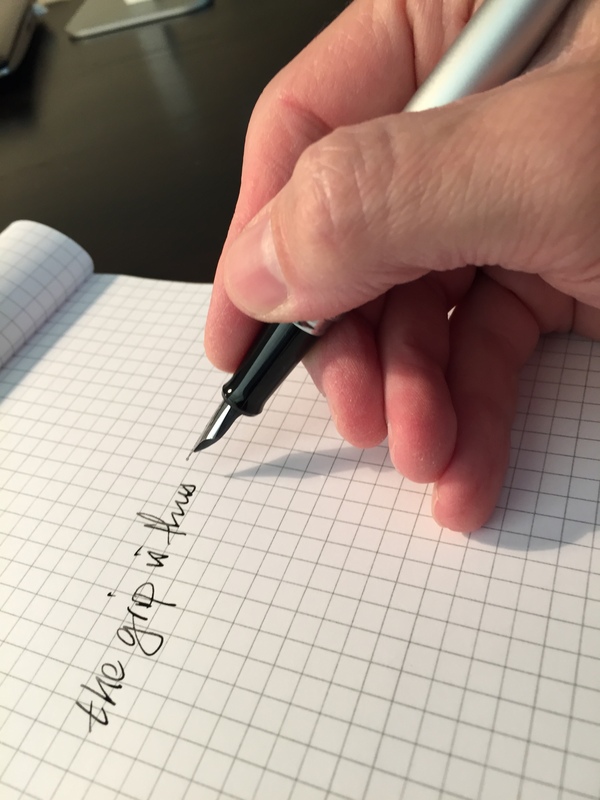 As my middle finger hooks around the step, it provides a perfect platform to balance the pen, with my index finger and thumb able to rest lightly on the top and side. I’ve found this facilitates a lighter grip nicely — particularly in someone who is making a conscious effort to be a little less heavy handed (remember that broken Metropolitan F nib I was talking about?). With the Tombow, at that same point in the grip section, although there was no step, the continuous taper towards the nib and smooth plastic finish left me wanting a little more control most times I wrote with it. This was most evident early in the mornings when both hand and pen barrel/section were cool, and I found my fingers sliding around a little on section. Not a deal breaker, however I certainly had less control, and was forced to grip a little more tightly, something I am consciously making an efforts not to do. Of course I then began thinking how the Tombow would make a perfect summer pen, when the Queensland humidity would ensure the grip section became nice and tacky — and just like that my pens started to become seasonal. What has become of me? Overall, I’d say these pens are quite similar (again!) in writing performance, particularly from the perspective of the nib. My preference simply comes down to the shape of the section on the Metropolitan being more suited to my particular grip. The most obvious answer here of course, is anywhere you would use a fountain pen, although there are a couple of other points I’d like to add. Although I have differing nib widths for both pens (a reminder: M on the Metropolitan; F on the Tombow), as you can see from the accompanying writing samples, both are on what you’d call the finer side of line widths. In a Baron Fig Confidant Journal. This allows these pens to function very well on paper where a broader, wetter nib might bleed and feather its way out of favour. A case in point being the Baron Fig Confidant notebook. Otherwise, my usual Rhodia pads have seen the most of both these pens for both meeting and general notes I have made at my desk in the office, a task for which I have found both pens well suited, given their understated look. That said, it has been nothing to carry either one in my pocket or shirt placket for use in a coffee shop note taking or planning session either. True, I notice the Metropolitan’s extra weight in doing so, however I wouldn’t say enough for me to avoid doing so. Both have again performed well, whether it be a few quick words written between sips, or a few pages written when ideas are flowing a little more freely. Either of these pens can be anything you need them to be. 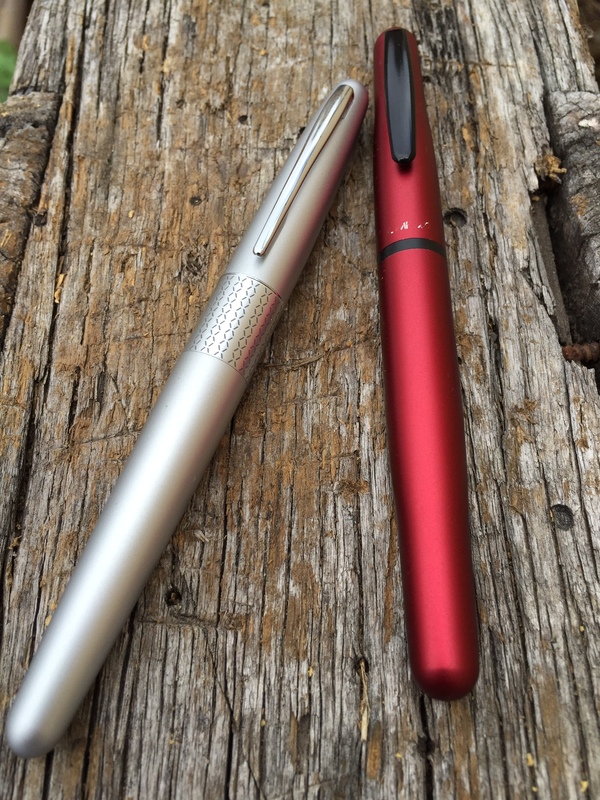 Put simply these are both great pens. 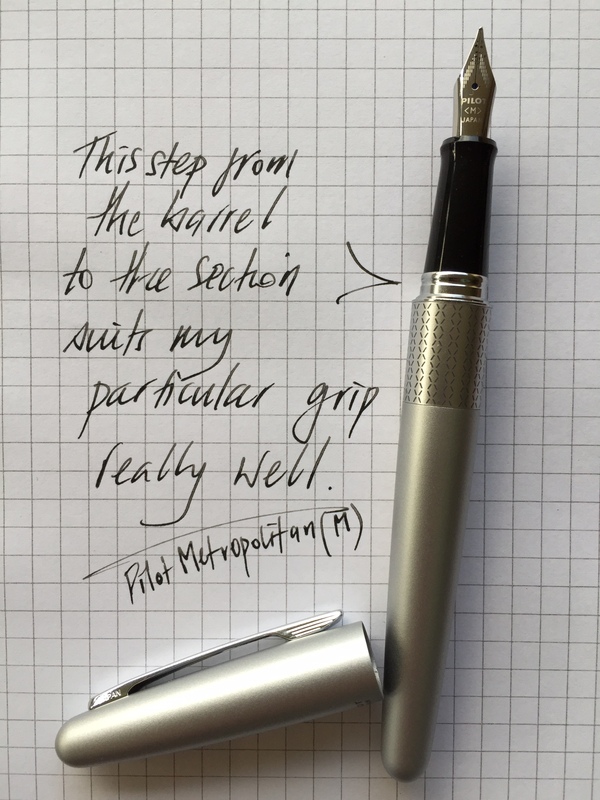 The Pilot Metropolitan is widely recognised as one of the best value for money pens out there. That very statement ”value for money” typically infers compromise, yet I certainly do not necessarily see that to be the case here — for either pen. For the respective price points, the materials are of course not high-end, however I think for both cases here, that simply adds to the satisfaction when using these pens. You have a great pen in either case and have spent only a modest sum for the privilege. If I had to pick, it would be the Metropolitan. Largely based on the better suitability of the grip for my particular style, and the lower price point really hammering home the value for money aspect. That being said, I would (and will) be happy to continue using both on a regular basis.